After being awe struck at the mere sight of Pisa Tower, I quickly composed myself and headed to the Cathedral. The Cathedral was open till 8 PM and it opened only by 10 AM, so my target was to finish seeing the Catherdral in the evening and see the Camposanto and Baptistery next day morning as those 2 opened by 8 AM! Anyways, my little happiness was that the similar, smaller works on the east and west transepts were visible. Now, check out the detailing – the way the mosaic pieces are arranged to follow the natural flow, the subtle tonal variation on the skin to show the depth perception, all that in not painting, but in mosaic work!!! The western transept has the relic of Saint Ranieri, who died in 1161. The curved wall of the altar was completely filled with paintings. The pulpit was a masterpiece in ivory. The sculptural detailing in it was just spectacular, or should I say, unusual. This was sculpted by Giovanni Pisano in 1302-10 combining the 3 orders, superimposed. Some of the figures in it, I could figure out, but the rest, I couldn’t. Atop were panels in each facet that told the story of some prophets and saints as well as Jesus Christ incl Slaughter of innocents, Escaping Egypt, Nativity etc. It has 8 pillars around and 1 central pillar. 4 were plain cylindrical while 4 were sculptural. The lower part of the 2 plain pillars had ferocious lions killing horses which I didn’t know the reason/story behind. The sculptural pillars were all humans depicting cardinal virtues and evangelists. There was a Moses clad in animal skin, there was a lady feeding 2 children on his breasts, a n*ked woman with an huge eagle (Daenerys of GoT was inspired by her? ), a woman holding a dead lion etc . The central pillar was a combo of 3 humans who shared forearms in the sculpture depicting the Arts of Trivium, Quadrivium and Theological Virtues. The present structure of the church was built after the 1595 fire. Didn’t I already tell you major arsons had happened all across UK & Europe time and again in history. The oldest surviving painting here is of 13th C. It is of Virgin with Child on a golden background and quite unusually infant Jesus is shown here holding a book on which a Biblical verse is written in Greek. When it was painted is unknown and in 1225 it was brought to the Cathedral. It was almost 8 PM and they were sending people out of the Cathedral when I came out. There were 3 doors and they were a thing of beauty with several panels of high relief bronze sculptures on them. I do not know when these bronze doors were made. Atop each of them, was this mosaic panel which such a gorgeous level of intricacy. On the edging atop the 2nd floor was this very interesting panel – an entire row of assorted animals in very amusing postures including pigs feeding the piglets! Just above the door, was a panel of Last Supper and scenes from the life of Jesus which were much more intricate and detailed and aesthetically pleasing than the larger sculptures. Right atop was this bronze sculpture of John the Baptist, greened today reminding me much of the sculptures at Stocklet Palace in Brussels. Inside, at the centre was the bronze sculpture of John the Baptist. The hexagonal pulpit here was an interesting one, but not as intricate as the Cathedral. On the wall was a tiny door, which was the opening to a curved staircase passage, hidden between the inner and outer walls, that took to the mezzanine floor. The baptistry floor is octagonal surrounded by an intricately inlay and cutout marble parapet wall. The pillars were plain but for the cornices which were sculpted with such detailing depicting mythological events and stories. This was a common factor in most of the 11-14th C Churches all across UK & Europe incl Canterbury, Basel etc. At one place, a lady informed me that the pagan origins of Christianity is the reason behind these sculptures that these spots were originally pagan worship spots. However I don’t know its authenticity and I’m yet to figure out the stories behind these imageries. If you know, please let me know. 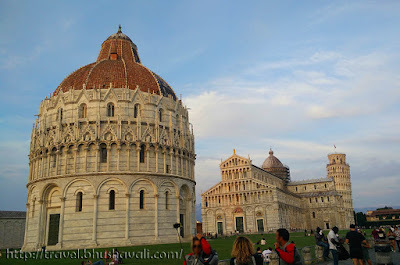 P.S: I was invited by Opa Pisa to experience the Pisa Cathedral, Baptistery, Museum & Camposanto for review purpose, however the opinions are my own and this post does not to advertise the product/service. I missed visiting the interiors of this cathedral. It was a Sunday and prayers were on. So glad to see through your lens. The stories are interesting. The floor pattern is captivating. Love the medieval architecture. Takes you back in time. And those paintings are just magnificent. You have captured all the details so well, especially the sculptural detailing. Here's hoping I head that side soon. The architecture is so beautiful! The mosaics are amazing. The details are truly stunning. Unfortunate that restoration and conservation was happening everywhere. That has happened to us as well in the past. Your photos and stories are bringing back some wonderful memories of a trip of mine back in 2006. Now I can't wait to go back to Italy..maybe stay in a castle and help restore it! The detailing in the mosaic is incredible - so much depth and obviously so much skill to produce such a masterpiece. Usually everyone is fascinated with the leaning tower of Pisa so it was really refreshing to read all about the Pisa cathedral. The architecture and interiors of cathedral are really intriguing. Unfortunately restoration was a hindrance in your trip. Getting up to get that clean shot is really worth. Like always loved your detailed post and pictures. I love cathedrals! They are so peaceful and majestic and this one is no exception! Beautiful photos, I really like how you use them to illustrate your visit. How unreal is that ivory pulpit, it's so stunning, and reminds me why I love visiting Italy. The attention to detail is so exact, and makes me appreciate the workmanship that went into making it! Awesome photos! The Cathedral is one of the places in my travel bucket list. The sculptures at the baptistery look really wonderful. They're too detailed and worth the time to gaze at. Your pictures of the Cathedral are absolutely stunning. Florence you pass as 'mosiac city.' These historical monuments are what make me love Italy irrespective of the headaches I had as a history student. The pictures are quite beautiful even though you did not get to see the entire place due to the restoration works. Many people don't even enter the cathedral...the leaning tower hogs all the attention! You took the time to study so many finer architectural details. Lovely! How amazing! The cathedral and other structures look so massive and equally opulent. I wonder how long it would have taken to build them. The amount of details in the mosaic work and the sculptures is something to look out for. I really love the details in your pics. That archetecture is unbeleivable! Such talented people that made these. Great read. It's nice to see that there is more to Pisa than just the leaning tower. I've never been but this cathedral looks beautiful. I love the details you captured. The Cathedral and Baptistry in Pisa are so beautiful and some of my favorites. I really liked that you described so many details and took the time to admire the beauty and craftsmanship, it helped me relive the last time I was in Pisa! I don't think we had a chance to visit the Pisa Cathedral. After soaking in the beauty of the leaning tower, we had to rush back to catch the train to Florence. Very beautiful, hope we can get a chance to return to see this. Italy is one of the places I would like to tour. They have great historical buildings with beautiful architectures. Too bad that your visit had to fall on their restoration works. It looks like they are doing a great job on the restoration as the structures and the artworks are well preserved. Wow! Some of those sculptures are definitely "interesting"...... That's a great idea visiting as it opens. Must have felt quite surreal being the only one there! I love how you add the times when you visit, this is so helpful for people like me who are planning to visit. Everywhere I visit seems to be under going restoration when I visit too, I think some famous landmarks are constantly being maintained! The picture of the cathedral with the leaning tower of Pisa behind it is beautiful, I'll try recreate this picture when I go, as well as the one of you in the previous post outside Pisa with no other tourists! Isn't it amazing when you actually stand in front of the work you admired for so long, back from the school days! No wonder it left you in awe. :) I'm always struck by master pieces! The cathedral is beautiful! I didn't get a chance to go inside when I visited Pisa. We were with a group and on a tight schedule so we just checked out the exterior. Nice job covering this! I actually went there myself a while back. Though, I wasn't quite as enthused as you were it seems. I found the whole thing to be super over-touristed, but, of course, it's still an amazing feeling to be there. Again a very nice article and pictures of sculpture of Italy. Nice mosaic work on the roofs of Cathedral. I have been to Pisa but never noticed so minutely. Your early morning shot of Pisa is really stunning and waking up early is justified after taking such a nice shot. What an incredible place. Your pictures of all the beautiful mosaics make me want to pack up today and head to Florence! Haven't been to see the Leaning Tower. 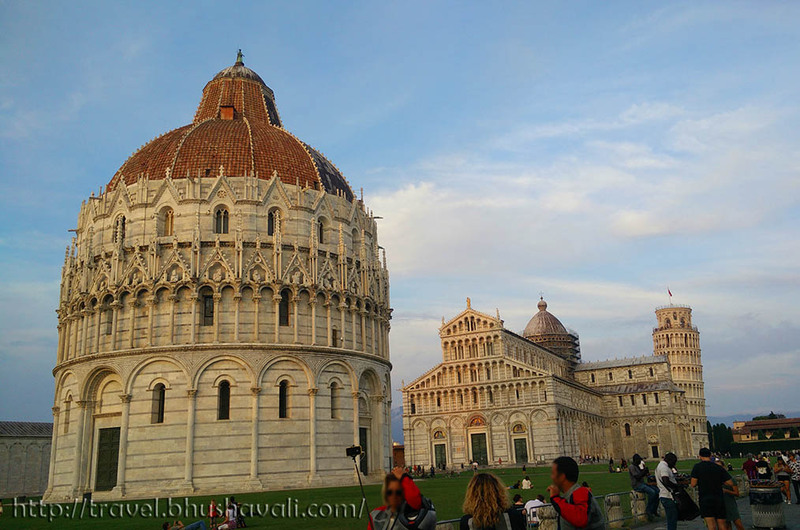 It is nice to know there is another beautiful masterpiece across it...the Pisa Cathedral! And, of course, I always love the sacredness and solitude of baptistries. Thanks for sharing. Love all your details and pictures :-) Very inspiring. Reading your post rekindled pleasant memories of Pisa. Indeed the Leaning Tower grabs your attention, gleaming white against the green lawns, but there is so much more to see. The Cathedral is magnificent and the interiors are exquisitely designed. A veritable treasure trove of art.